SmartTips: Who Are the Xers? Collaborating across generational boundaries requires knowing what skills and work styles are specific to each generation. This SmartTips video looks into the characteristics of Generation X, the generation nipping at the heels of the Baby Boomers. SmartTips: Who Are the Traditionals? The senior generation in the workforce today is the Traditionals, born between 1927 and 1945. Like the other three generations that they are now working with, this group has its own characteristics and values. Learn about them in this SmartTips video. The answer to intergenerational issues facing employers today is understanding. Each generation brings its strengths. The Millennials are touted as the most technologically savvy generation. 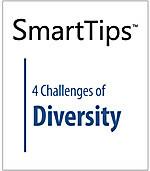 This SmartTips video details what they can contribute. SmartTips: Who Are the Baby Boomers? With the convergence of four generations in the workplace, it is helpful to know the differences between the generations in order to understand the behaviors of each. This SmartTips video takes a look at the Baby Boomer generation and its work habits.